“Bel Assis” was the name of the ‘Messuage and fifty seven acres of land in Hamstede’ which Sir Roger de Brabazon gave to Westminster Abbey in 1317. Today the village, named from the French for “Beautifully Situated”, is known as Belsize, a quiet backwater in the London suburb of Hampstead and home to Mo Foster, one of the finest bassists in Britain. The road which led to ”Bel Assis” was a long and winding one taking Mo through jazz with Gil Evans, rock with Jeff Beck and Phil Collins, and blues/jazz/folk with Affinity, Joan Armatrading and Van Morrison. Dozens of albums carry a credit for Mo including a few as producer. Bel Assis was borne out of Mo’s desire to work during 1987 on something less emotionally shallow than the then current crop of contemporary pop. He wanted to fuse the flexibility and precision of computer music with the warmth and emotion of ‘real’ performance on ‘real’ instruments by the best musicians available. Finding the musicians was not a problem . But the real pleasure lay in the enthusiasm which his friends showed through their playing. What friends – Gary Moore and Rod Argent are amongst the cream of musicians who recorded this album during 1987 and 1988. 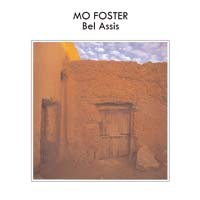 This instrumental album is a collection of souvenirs, bringing together musicians, memories and many musical styles which Mo has been involved with and enjoyed on the way to ”Bel Assis”. Remastered-enjoy! If you like dreamy and inspiring soundscapes you will adore this 1988 album, the playing by all concerned (including the great Ray Russell guitaring on most tracks) is faultless whilst Mo Foster's compositions are melodic and immediately listenable. What could have become a muso's offering with its head in the ether is highly accessible, slightly new-agey, but always enjoyable. It's a damn shame Jazz FM in the UK has taken the soul route, because Mo Foster's blend of smooth jazz to rock grooves would sound good on radio, preferably mobile with the hood down, late night. A rare treat. Its an instrumental album to enjoy at your leisure that's not saying it is background music, though. The musicianship is top class as you'd expect and a mix of styles from jazz rock (So Far Away) to New Age (A Walk In The Country) through to AOR (The Light In Your Eyes). Hints of Pink Floyd on Analytical Engine, whilst the title track features a relaxing bass line from Mo Foster delightfully underlying Ray Russell's acoustic guitar passages. If anyone remembers the Private Music label from the late 80s (home to Rod Argent, Tangerine Dream et al) much of the music on Bel Assis would fit onto that label's remit. ...a forgotten minor classic. Clarity of sound and pinpoint accuracy of timing are just the start. The true appeal lies in its simple grace and emotional warmth. ...stands strong with some great musical pieces and great performances. ...an album of outstanding craftsmanship...a collection of beautifully crafted instrumentals in which Mo's role as bassist is perfectly balanced...A welcome CD reissue. ...well thought out, solidly constructed instrumental album. This isn't New Age, but an album that has a purpose...shows that Mo can produce an instrumental album that is interesting and enjoyable and not self-indulgent.